Odors in any situation can be off-putting; odors in commercial settings can lead to some potentially horrifying situations for restaurants, hotels, HOA building maintenance companies or any commercial facility that houses employees or customers. Take for example, company bathrooms — they can sometimes be creepy places but not because there are scary things to see in there. It’s rather about what is invisible and lingers beside you, enveloping every move that you make while you use the facility. That’s an odor molecule for you, and it has many, many friends that are quite content to party it up while they destroy your customer loyalty, company morale and online reputation. In fact, we recently wrote about what’s been considered one of the worst smelling public bathrooms in the country, five route causes of commercial washroom odors and an arsenal of the latest restroom professional odor neutralizing options to eliminate them. While bathroom odors can be downright disgusting, they are just one unpleasant part of a business facility’s olfactory challenges. First off, it’s important to remember that odor molecules aren’t the same as pathogens, as both bacteria and viruses require much force in order to be transmitted into the air. Even more, molecules of a particular substance that cause a bad smell travel up into your nose and often leave a residue that can be very unpleasant. Yuk, right? Secondly, while smells for the most part do not contain bacteria, gaseous compounds can adversely affect your health by causing shortness of breath, eye irritation, headaches and if inhaled in large amounts, death. Gasses also can be flammable and even explosive. In these cases, whatever you do, don’t light a match to see if you can catch the odor in the act! Accept that you are not alone (maybe even say goodbye) and leave the premises as quickly as you can. So what can a business owner do about the many unwanted odors that might arise within a commercial facility? Well, first you need to know how to identify them and their source, and then you need to call a professional to eliminate them. While odor removal may sometimes involve experts outside of the air care industry, scent marketing and odor control solutions are an essential key to rectifying malodorous situations, and once the source of the smelly culprits are addressed, installing proper air care and odor-neutralizing systems is essential to maintaining a healthy, hygienic commercial environment for your employees or customers. This article will help any owner or business facility manager understand the eight worst and most potentially damaging odors that can develop in buildings or other commercial environments, what they do, what can happen when too many of them enjoy an endless party in your company facilities and some effective professional solutions to eliminate them. But before we get started, let’s briefly explore the absolute importance of addressing odors the minute they are discovered. Bad hygiene and foul odors in the workplace can greatly affect the health and productivity of employees. Dealing with a fellow worker with bad personal hygiene is an issue for personnel and/or Human Resources, but there is a much greater problem if an odor is emanating from somewhere in the work place. The key to solving this dilemma does not lie in the smell itself, but rather in determining its origin and whether or not it is harmful to humans. If the offensive odor is related to the nature of the work, such as a sewage plant or dog food company or such, the smell cannot be eradicated. However, it is possible that the problem can be ameliorated with the addition of vents, fans and commercial air-freshening machines that diffuse Metazene®, an odor neutralizing additive that destroys vaporous odors at the molecular level. If the bad odor is connected to toilets overflowing, open pipes with sewage gas, spoiled food or bacteria-producing agents, employers may have trouble keeping their hair from standing up on end because this could prove to be a very costly matter. They are urged to fix things quickly because it is that point when health and safety laws and potential legal interaction are likely to infringe on a company’s production and profits. There odors and then there are odors. The following list presents the worst of the worst when it comes to smelly, off-putting and potentially dangerous smells. Rest assured, every business owner working within a commercial setting should be aware of the following, for the sake of their health, their employee’s, their customer’s and above all their business’. This complex mixture of toxic and non-toxic gasses can contain hydrogen sulfide, ammonia, carbon dioxide, nitrogen, methane, and hydrogen sulfide, the last two of which are highly flammable and potentially explosive substances. These gasses, which are produced and collected in sewage systems by the decomposition of organic household or industrial wastes, are also of concern due to their odor and health effects. Mold spores may also be present in sewer gasses depending on their source and other factors such as humidity and building and weather conditions. If the gas seeps though cracks in a building’s foundation, exposure can easily occur, especially for those who work in the sanitation industries and on farms. Hydrogen sulfide is a common component of sewer gas with a foul stink that is reminiscent of rotten eggs. It is produced by the bacterial, oxygen-free breakdown of organic material. Bad smells always have a story to tell and usually serve as a warning that something is wrong. If it smells bad, it probably is bad (or if you prefer, if it walks like a duck and looks like a duck, etc). Although this gas does not cause disease, even small amounts of it can be fatal because when the molecules enter the nose they attack the central nervous system. The health effects of hydrogen sulfide are contingent on the amount inhaled and for how long. At the very least, low concentrations can cause irritation of the nose and throat and lead to a loss of appetite and headache. Higher concentrations can cause eye damage and accumulation of fluid in the lungs. Methane is a potent climate pollutant and a highly flammable gas that ranks second only to carbon dioxide as a greenhouse gas. It is the major component of natural gas, a fossil fuel commonly used in restaurants and residences for heating and cooking. Methane sources include: landfills, oil and natural gas systems, raising livestock, rice agriculture, coal mining, stationary and mobile combustion, wastewater treatment, and a number of industrial processes. The Unites States as well as China, Russia, India, Brazil, Indonesia, Nigeria, and Mexico are estimated to be responsible for nearly half of the world’s methane emissions. In high concentrations, methane can cause unconsciousness or death by suffocation. Headaches, dizziness, weakness, nausea, vomiting, and loss of coordination can also occur. All business owners must take special notice of this dangerous gas and do all they can to prevent it from seeping into their establishments and causing all kinds of legal repercussions. The main issue is industrial wastes of all kinds, as methane is generated in municipal landfills as part of the natural decomposition of waste and the treatment of wastewater. The technology to fight this toxic gas is widely available and affordable via a 16-part study conducted by the Environmental Defense Fund. If your business is landfill and waste management, NCM Odor and Dust Control is a global leader in manufacturing and servicing neutralizer products and higher pressure atomizing systems for landfills and remediation sites. Carbon dioxide in both solid and in liquid form is used for refrigeration and cooling, and has many applications within the food and beverage industry. These range from carbonating drinks and conserving wine to modifying the environment for packaged foods. Dry ice, or solid carbon dioxide, is also utilized for the storage and transportation of temperature-sensitive products such as frozen or chilled foods and medical or pharmaceutical materials. This colorless gas can be deadly and the fact that it is the only one on this list that is odorless does not mean business owners where this gas may be present should not be concerned or believe that their hair will remain in place if something should happen. Of all the chemicals listed, this is by far the most dangerous and potentially lethal. Employers in the food transportation and restaurant industries must assess the risks posed to employees and this will require efforts that include specific gas detection testing. Ammonia is one of the most commonly produced chemicals in the United States. It is used in both industry and commerce, and about 80% is produced by the agricultural industry and utilized as fertilizer. It also serves as a gas refrigerant, purifier of water supplies, and an integral component in the manufacture of industrial-strength cleaning solutions, plastics, explosives, textiles, pesticides, dyes and other chemicals. At room temperature, this colorless and highly irritating gas emits a pungent, suffocating odor. Exposure to high concentrations of ammonia causes immediate burning of the nose, throat and respiratory tract. This can further lead to respiratory distress or failure. Inhalation of lower amounts can cause coughing and nose and throat irritation. This is one smell that is obviously not always misplaced, as our beloved canines sometimes do smell stinky sometimes. But if your company does not have any dogs on the premises and your employees are complaining that there is a stinking dog hidden somewhere, it’s time as a business owner or manager look into the problem. This can get very icky, for the odor could be stemming from rodents or other small animals dying behind office or business walls. For help with this situation if your business is in Western Pennsylvania, Ohio or West Virginia, we highly recommend Pestco’s Complete Facility Care program, which offers one complete, convenient, bundled service providing pest management strategies, ongoing restroom cleaning and hygiene maintenance as well as professional air freshening solutions created by our scenting, air care and odor control experts. The proper operation of any business is dependent, either directly or indirectly, on clean running water. It is the mainstay of life and despite strict purification methods that are heavily regulated by the Environmental Protection Agency (EPA), foul-smelling chemicals, bacteria, sediments, heavy metals and other contaminants can still make their way into your company’s tap water. Not only can these contaminants create an unpleasant taste and /or smell, they can also make your business’s water unhealthy for patrons and staff to consume. Bad water can take on a variety of smells, each indicating the presence of diverse toxic elements. A metallic taste usually indicates that heavy metals like mercury, lead, arsenic or iron have infiltrated the company water supply; the smell of rotten eggs is unmistakably hydrogen sulfide gas that can either be caused by a chemical reaction with soil minerals or the decay of organic matter. Earthy odors are pleasant when found in exotic Air-Scent air freshener fragrances, but if the water in your business establishment is taking on such a taste and scent, it may indicate the presence of dissolved solids or iron bacteria in the company water supply. A fishy smell in water is not an indication of what may be for dinner. It is rather a sign that the water in your office coolers has been treated with a disinfectant known as chloramine at your municipal water treatment plant. High levels of chlorine make tap water smell like the beach, without benefit of sun, sand, fun and surf. Even though chlorine is a disinfectant, the resulting smell is unpleasant and may not be safe for business staff or customers to consume. These odors emanate from many different sources and they can become a problem and cause headaches and nausea. Some may be toxic and have harmful health effects. Toxicity is dependant on the amount of the substance that is in the air, how frequently people are exposed to that air and how much time is spent breathing in that air. Environmental odors include: carbon monoxide, nitrogen dioxide, lead, ozone, particulate matter and sulfur dioxide. The Environmental Protection Agency is responsible for controlling 187 hazardous air pollutants but only regarding their toxicity. Company odors are the responsibility of the nervous business owner or manager whose palpitating heart warns of a loss of traffic, visiting attorneys and that all-important bottom line if something isn’t done to correct the situation. With seven-plus decades of experience refining our patented air freshening diffusion systems and odor neutralizing products, there isn’t a malodorous challenge we can’t eliminate in both large commercial areas and small. The Aroma One fan dispenser, combined with 30-day liquid or solid high performance refills, has been strategically designed to provide vaporous diffusion for smaller spaces such as washrooms, entryways, hallways and more. 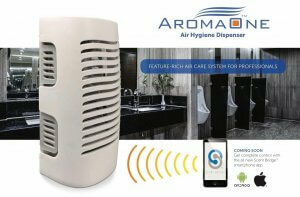 Only the AromaOne dispenser features so many thoughtful enhancement making it the only choice for professional air hygiene for the jansan and route service industry. For larger areas such as basements, storage areas, gymnasiums, large bathrooms, locker rooms, lobbies or banquet halls, the newly-designed, mobile-App controlled Aroma Beam simultaneously provides a consistent flow of fresh, tailored scent evenly across any space up to 50,000 square feet. From Scatter odor granules for eliminating trash room and dumpster-born odors to biological degraders for drain-related odors, our arsenal of air freshening products is as diverse as any odor is complex, and every one of them contains Metazene®, a highly potent neutralizer that effectively and safely annihilates odor particles at the molecular level. These are all just a few of our many products, and they each have been built to effectively destroy any unsavory, aromatic scourge affecting any-sized business facility. Learn more about our company’s decades-long history, our diverse array of ambient scent marketing devices and air freshening products as well as our in house fragrance creation division, or speak with our sales team today. The endless tapestries of odors that comprise our environment are facts of life that must be addressed and not feared. Understanding the dangers that they pose is the first step in rising above them and the damage they can do. Employers must be diligent about addressing the needs of their employees and workers must inform their supervisors about bad odors as soon as they notice them. True teamwork is the answer to good business hygiene and the elimination of harmful chemicals (and looming attorneys).